Escape the hubbub of the South Rim on this historic trail that takes you to Hermit Rapid at the Colorado River. Note: This trail is a rim-to-river hike that is completed as part of a backpacking trip. For day hikers, a good turnaround point is Santa Maria Spring (5 miles roundtrip). The park’s main corridor trails have their perks — wide paths, rest houses, and water stations. 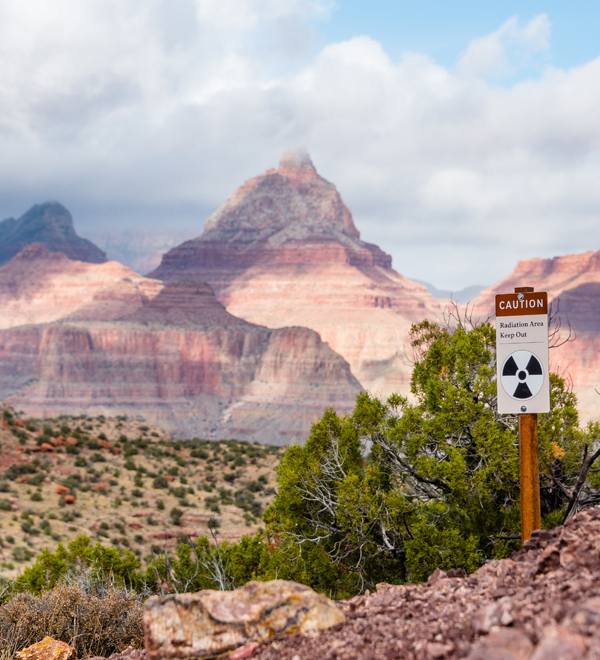 But if you’re looking to break free of the hordes of people and mule droppings on the Bright Angel and South Kaibab trails, you best leave Grand Canyon Village. The Hermit Trail was actually born out of this very desire. In 1911, the Santa Fe Railroad began developing the Hermit Basin as an alternative to the Bright Angel Trail, which was then operating as a toll road. 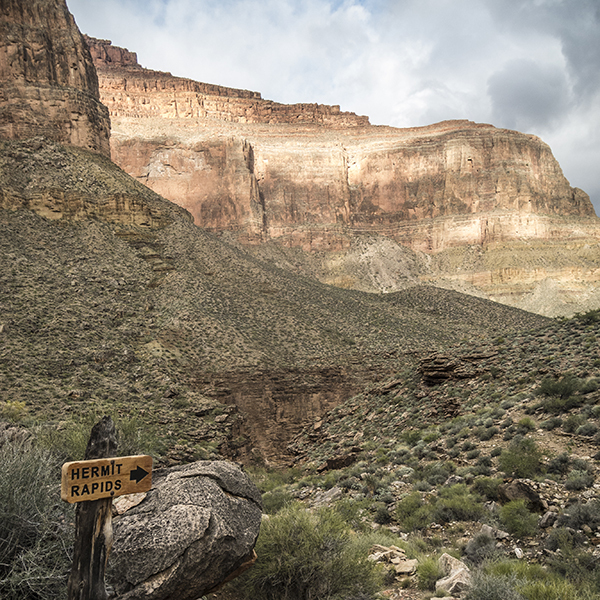 Much of the Hermit Trail is rocky and eroded today, but a few sections of hand-fitted rock slabs hint at its former life as the South Rim’s state of the art rim-to-river-route that serviced a luxury camp along Hermit Creek in the early 20th century. From the trailhead, follow the gravel path south, beginning a steep and steady descent through the upper rock layers — Kaibab Limestone, Toroweap Formation, and Coconino Sandstone. Switchbacks intensify as you drop through the Coconino, easing up as you hit the rusty-colored Hermit Shale. At 1.3 miles you reach the junction with the Waldron Trail, which comes in from the left. Continue straight (west) on the Hermit Trail, and in a half mile you reach another junction with the Dripping Spring Trail. Veer right to stay on the Hermit. If you’re day hiking, this is a great destination; turn around and retrace your steps back up the Hermit Trail. From Santa Maria Spring and rest house, the trail hugs the right canyon wall in a long traverse through the Supai Formation. Frequent gullies cut into the slope at perpendicular intersections, forcing you to pick your way across sketchy rockslides. The route through these boulder areas can be difficult to discern, so look for cairns and follow your best judgment when necessary. A series of switchbacks drops you down to Lookout Point, where the trail crosses a saddle between the canyon wall and a blocky Supai knob. The traverse continues at more or less a level elevation, but watch out for the worst gully detour just before reaching Cathedral Stairs, the name for the brutal descent that awaits. Rocky switchbacks cut through the Redwall Limestone, weaving past spires and towers as you make your way down to the talus slope below Cope Butte. From here, follow the sweeping switchbacks down the scree pile until you hit the Tonto Trail (7 miles from the trailhead). At the junction with the Tonto, turn left (west) and follow signs towards Hermit Creek. The grade of the trail eases for the next half mile, until you are simply contouring along the canyon wall. For people camping at the river (BM8): A cut-off trail breaks off to the right towards Hermit Rapid. Drop down to the bottom of the canyon, and continue downstream until you reach the Colorado River. Cairns mark shortcuts across the banks, but rockhopping along the stream bed will get you there too. For people camping at Hermit Creek (BM7): Stay straight at the cut-off trail junction, and continue contouring back into the drainage. You pass remnants of the historic Hermit Camp, which in the 1920s included an aerial tramway and Fred Harvey Company chef! Today, you can still see foundations, cisterns, and the lower terminus of the tramway. The trail eventually drops down to creek level around 8.2 miles, where you’ll find today’s National Park Service campsites — with the only amenities being a single pit toilet. From the Hermit Creek campsites, you can continue 1.5 miles downstream to reach the Colorado River at Hermit Rapid. The gorge in the Tapeats Sandstone is beautiful, and you’ll get to see some small waterfalls along the way! Hermit Creek and the Colorado River are the main sources of water here. Purify and filter all water before drinking. Hermits Rest, the last viewpoint on the west end of Hermit Road, serves as the trailhead for this hike. Hermit Road is open only to shuttle busses from March 1 to November 30. You can park your vehicle at the Backcountry Office in the village and take the free and frequent shuttle bus (Red Route) to Hermits Rest (last stop) at the end of Hermit Road. Or, with your backcountry permit for either of these trails during those months, you may drive your private vehicle to the trailhead. Just punch the numerical code (printed on your permit) into the keypad, pass through the gate, and follow the road west to Hermits Rest. Once there, follow a signed dirt road for a quarter mile to the parking area. Check the park website for current information about driving your car or taking the shuttle. Fee required – Fee required—Camping below the rim requires backcountry permits and additional fees. Check the website below for current information.